On Mother’s Day I drove my clan into the city to watch them run the 8km Mother’s Day Classic – which is possibly a tad overstatement as a name, but it was a classic Autumn morning. 40 years of football have taken an unfair toll on my knees, so I no longer run, but chauffeur and cheer enthusiastically from the sidelines. As they pushed and puffed their way around the course I had a call of nature, so wandered over to Hyde Park to go to the loo. It was then that I realised society has indeed gone completely mad. You can no longer go to the loo. There’s no men’s or women’s toilet you can stroll (or rush) into at your leisure to complete your ablutions. No folks, instead, you now have unisex street furniture. Gotta luv a marketing buzzword. Now the only species I know that is interested in peeing on street furniture is our friendly K9s. 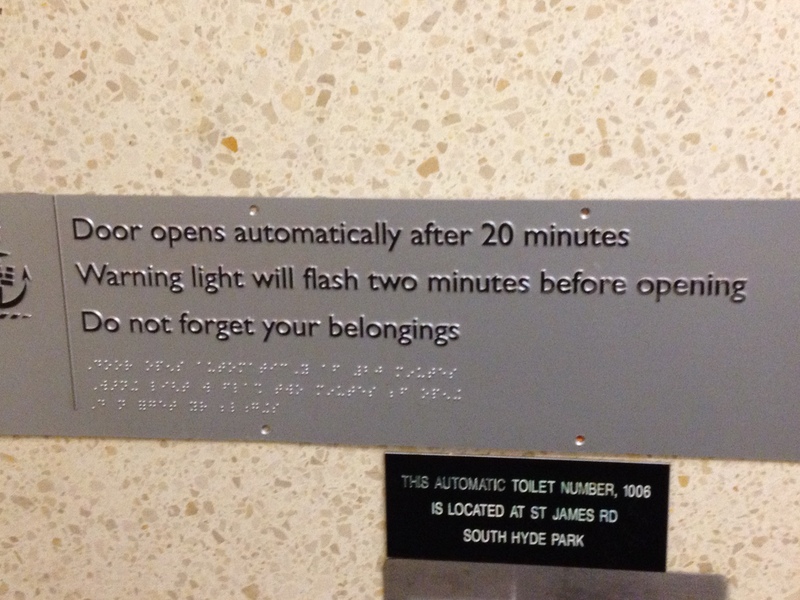 But some bureaucrat has deemed it is now the preferred option for humans who need to use a public loo. The street furniture was easy to spot. There was a queue of people hopping from one foot to the other while waiting their turn to use the only street furniture that worked. 50% of the furniture was out of service. There was only one loo as far as the eye could see, to service an entire park full of punters. I joined the queue and waited. This gave me time to check out the instructions on how to use said street furniture, as obviously we adult humans need training in how to go to the loo. Here’s some of the instructions, which read more like “orders” – you got the feeling someone was watching you to make sure you obeyed. 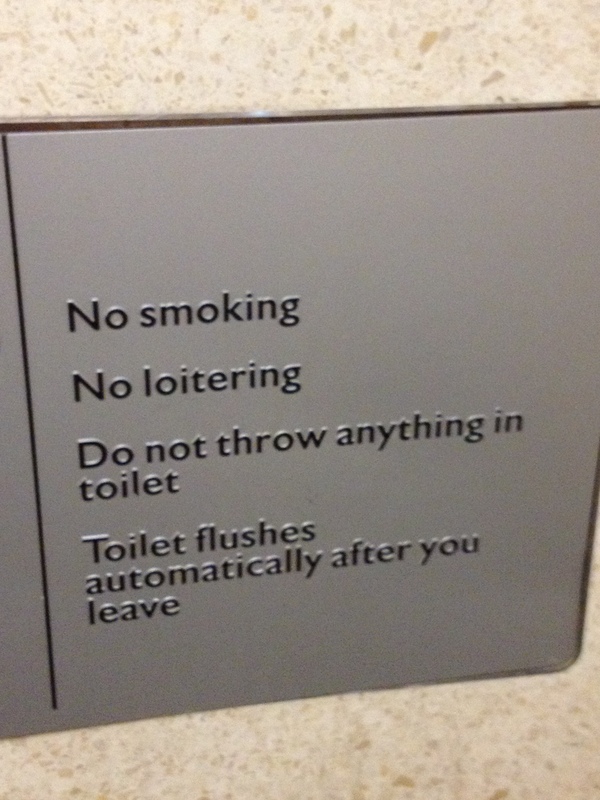 so where do you throw the loo paper? The loo paper looked like it was a runner-up in a product test for industrial sandpaper. I’m sure it could have scraped paint from the side of the street furniture. The cleaning cycle involves some sort of automatic internal washing and spraying that completely wets the floor. Everything was wet – you didn’t know what to touch. If you want to drop your duds and sit, you have to hold them above your ankles so they don’t get soaked on the wet floor – not an easy thing to do, particularly if you are in any way incapacitated, or just like to sit upright as you go about your business. The company that ‘manages’ the street furniture is the same one that manages the advertising in bus shelters and other ‘street furniture’. It’s no wonder their were so many signs on the thing. 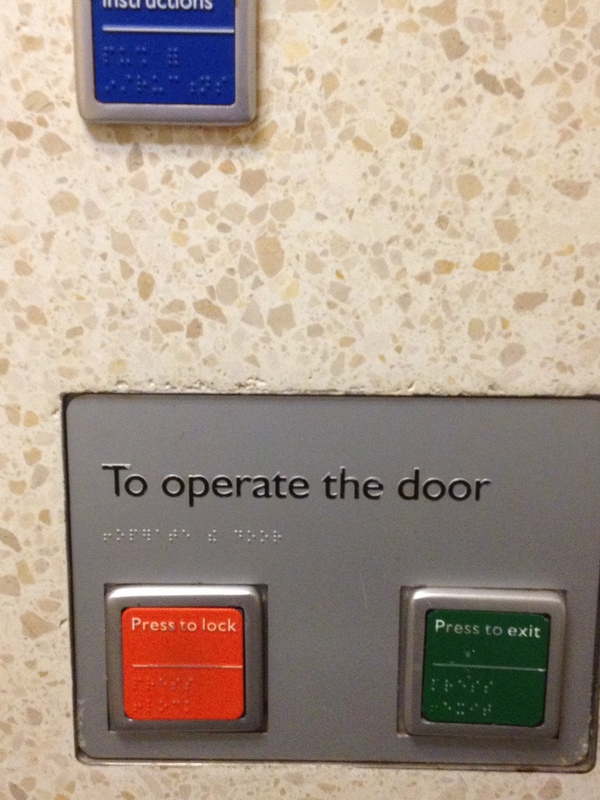 I’m sure the directors of said company don’t have these types of “inconveniences” installed in their offices. I suspect they can come and go to the loo whenever it suits them. No queuing in line while the cleaning cycle does its stuff. Luckily I was able to understand the orders and survive the street furniture ‘customer experience’. I’m sure that term is in a strategic document for the street furniture proposal. Mind you it would have been faster and easier to go behind one of those very large trees in the park. But imagine the uproar if I was caught doing what comes natural in a park? 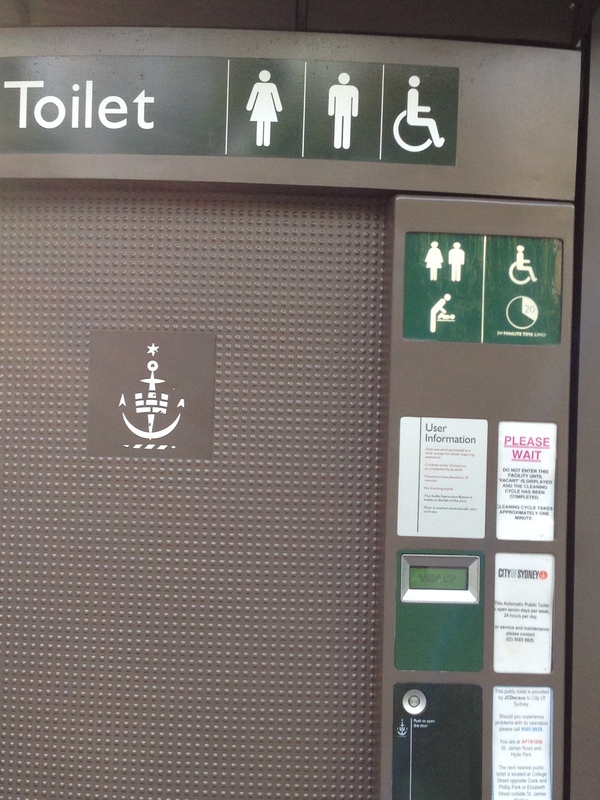 Here’s an idea for the ablutions bureaucrats – install men’s and women’s loos with multiple facilities (even unisex facilities) – and doorways you can enter at your leisure. 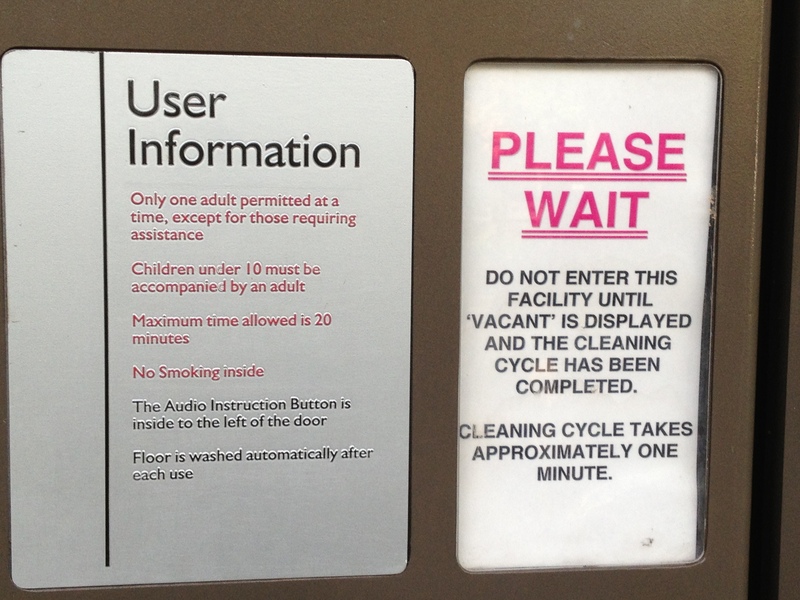 Don’t restrict the facilities to one unisex unit that takes longer to clean than to use. Remember peak hour in your own family bathroom? Then install street furniture for the purpose of sitting on, not sh*ting in. You’ll be amazed how many people use it. 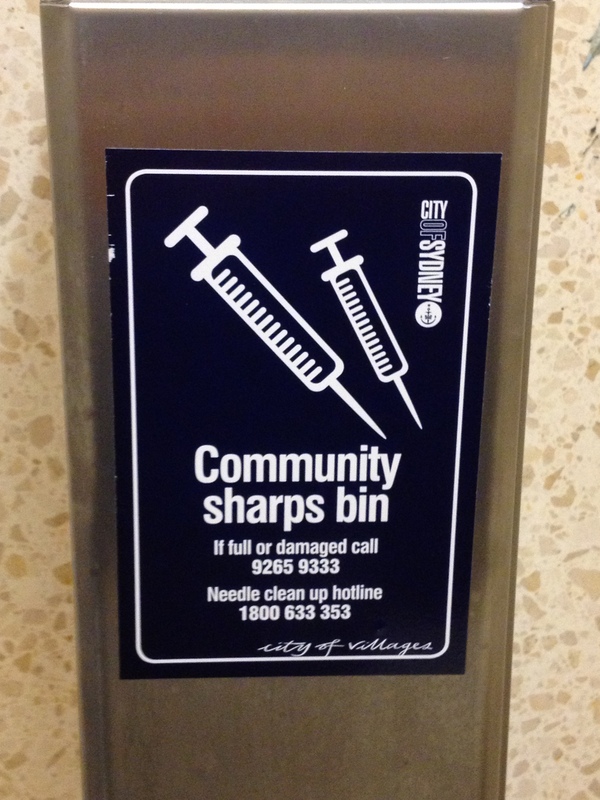 I wonder what would happen if this “cutting-edge” technology was installed at the MCG (SCG)? Imagine Grand Final day or the boxing day test! I bet they didn’t research it…or maybe they did but the manufacturing team (Government Subsidy) was too far down the track! How on earth will the human race survive with this level of bureaucratic inadequacy? At least i can still get a pot of Carlton (Schooner of New) at the local and not have to queue up to dispense end-product! We call them ‘Porta-Potties’ in the USA. From your description, your street furniture sounds a lot more civilized than ours, though ours are more frequent around baseball and soccer fields, which I use often as I attend 3-4 games each Saturday. Thanks John, we have Porta-Loos here, but they are portable. The loo in this post is a permanent one that replaced the larger men’s and women’s loos that had existed in the park for over 100 years. Thanks for clarifying, Mal. And here I thought I was introducing a true American innovation to Australia! Actually NYC has tested similar perma-potties but has not ‘rolled out’ due to bureaucratic snafus.